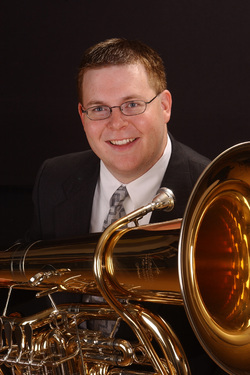 Dr. Steven Maxwell is Associate Professor of Tuba and Euphonium at Kansas State University. In addition, he teaches brass techniques and the History of Rock and Roll. Dr. Maxwell is also the tubist with the K-State Faculty Brass Quintet and the director of the K-State Tuba Euphonium Ensemble. He is an active clinician, adjudicator, and soloist throughout the United States and Europe. Dr. Maxwell has been active internationally performing at prestigious conferences including the International Tuba and Euphonium Conferences and the U. S. Army Band Tube-Euphonium Workshop. He has also performed at numerous regional conferences over the years including the Great Plains, South Central, Rocky Mountain, and Southwest Regional Conferences. He has held the position of principal tuba with the Chautauqua Festival Orchestra, Central Iowa Symphony, Kansas City Puccini Festival Orchestra and has been a member of the Fountain City Brass Band. Dr. Maxwell is an associate editor for the International Tuba and Euphonium Association (ITEA) Journal. He is a member ITEA, Phi Mu Alpha Sinfonia, and is an honorary member of Kappa Kappa Psi and Tau Beta Sigma. Maxwell is a champion of new music for tuba and euphonium and has commissioned over fifty works for solo tuba, solo euphonium, and tuba-euphonium ensemble. He has featured six of those new works in his first solo album entitled “Pretty Please?” which was released in 2018. Dr. Maxwell is proud to be a Miraphone Performing Artist.